Childcare has been pretty topsy turvy. I’ve had kids out because of colds and influenza. Kids have been picked up of the early or dropped off late because of doctor appointments. We’ve had two hour late starts because of the terrible cold. My nurse have had to flip flop their days and hours. That’s what I mean by topsy turvy. I the winter I set up the basement or the garage so we can escape the house at least a little bit. Here we are in the basement and I have the water beads out. I’m guessing you might not have heard about water beads. I’ve been doing childcare for years and hadn’t heard of them until last year. They are available on Amazon. Here’s a link. They come in a bad like this. The little “beads” are the size of a large pin head. By taking a teaspoon of the beads and adding them to a quart of water I ended up getting a watery bead that is about 1/2 big. The bead absorbs the water and expands. They are watery and a fun texture. I get the non toxic kind as I have kiddos that are at risk of trying to eat one. I add spoon, cups, pitchers and funnels. The kids love them. The bag of beads is HUGE and will last me likely a lifetime. I typically make a 4 teaspoon or gallon of water’s worth of the beads for the group of kiddos I have. I highly recommend these for a sand and water activity. They last a LONG time too. I keep them for a month at a time. It take an overnight for them to expand to size. We’ve been busy with some homemade play dough a friend of mine made. In the past I’ve made only one color. My friend made several colors all in individual containers. It has been very successful. No arguing that one kid has more play dough than another!! I have lots of kids that are moving up and trying to hit new milestones. Carver is working on using a spoon and having a bowl or plate. This day he was doing so good with squash. I turned around to get second helpings for another of the kids and WHAM. He was covered in squash!! Just look at that little stinker!! We’ve had a couple late starts because of the cold weather. This day I was SO-SO happy to see the school bus come and for the big kids to be on it!! Boy was it quiet when they left!!! This is a typically morning activity at my house. We do circle time teamed with snack time. I read books, use manipulatives for rhymes and sing songs to the kiddos. Kalissa was here this day and volunteered to do it. I loved that she did as I got a chance to snap a picture. The kids’ favorite… Five Little Monkeys Jumping on the Bed. These two make me laugh a lot. 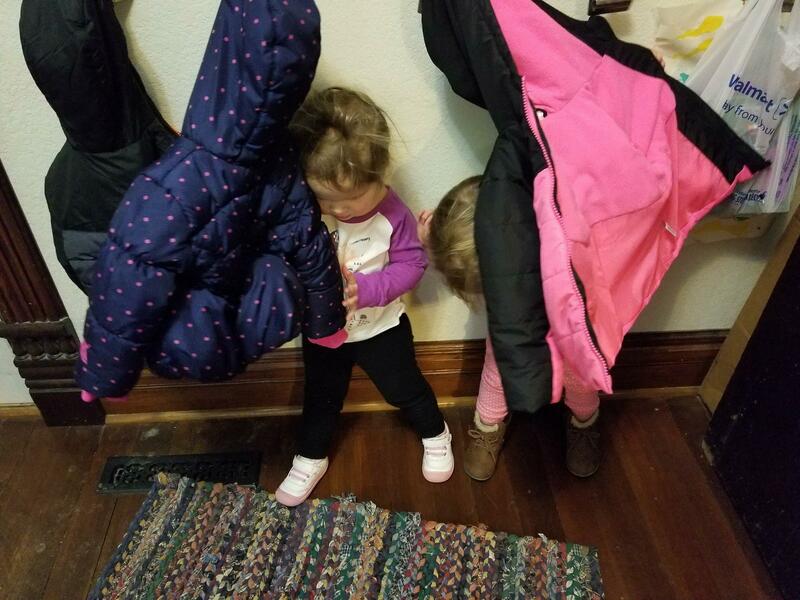 Here they are hiding behind their coats on the hooks and playing peek a boo with me! We had a no school day due to snow and ice. I only had one little one. I make plans to bake with this bunch. We declared it apple pie day!! Karl and I peeled a bunch of apples and quartered them. I gave the bowl of peeled apples to the kids along with butter knives and had them cut up the apples. 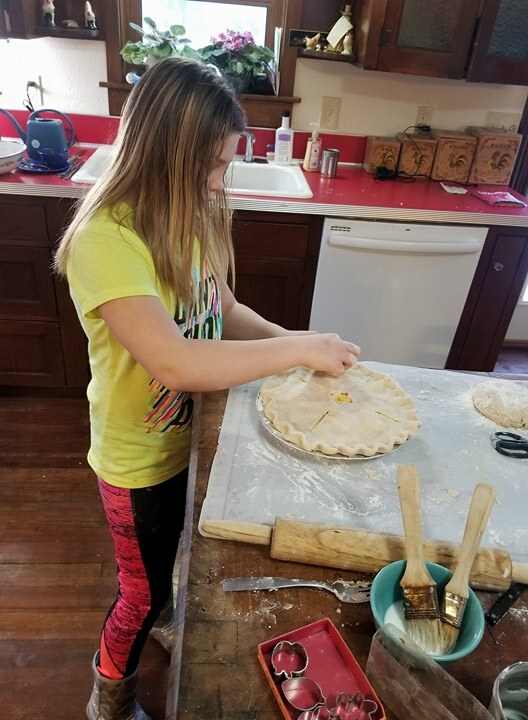 Then while the baby was sleeping each of the sibling groups of kids made a pie crust from scratch rolling it out and making it with minimal help from me. They did awesome!! Below this sibling team is “painting” their pie with milk and will then sprinkle it with sugar. They LOVED doing this!! Here this sibling pair is working on theirs. They did all the rolling. The blond haired girl would pick up the rolling pin and start humming. It was so cute. I was giggling a lot on this day!! My Neighbor Girl was over and she made a pie for her family too. She was so good at it! 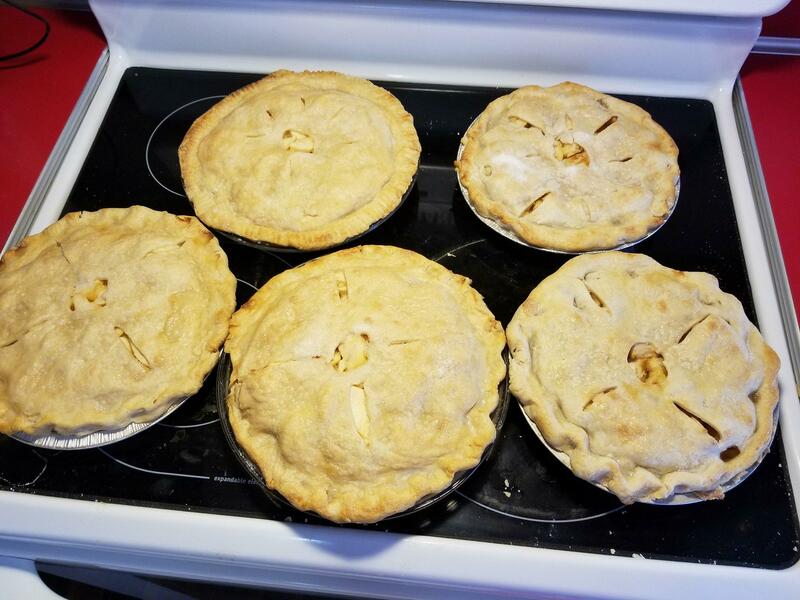 By now my baby was awake from his morning nap so she finished the pies for my house. She is so helpful. Here are our pies fresh from the oven. Oh I love baking!! All in all childcare is going good. I have lots of kids that are to the point of starting transitions….I have three that need to start some potty training before long. I have two that need to get out of high chairs and cribs before long. These are always tough times making the transitions… It’s starting little by little. I so wish we could have the jump made by summer and if that’s going to happen, I have to start working on it slowly now. I’ve had two inquiries about openings in my childcare in the last week. Both for small babies. I’m not taking any new babies right now. I have one on a waiting list and that will be enough. Should an 18 month old (or so) come my way, I could likely squeeze one in. No babies though…. I want to enjoy my time with these kiddos and a new baby always makes that hard. I really wish the schedules would settle down and get a little more predictable again. I wish we could by-pass some of the colds and sickness but all in all, even with all of that, we’re having a good time. This entry was posted in childcare on February 8, 2018 by Jo. You must have gone through an awful lot of apples that day! The pies look wonderful! My favorite way to mix pie dough is in my food processor. It’s like magic. My mother in law used butter-flavored Crisco quarters (sticks), so that’s what I use as well. She was famous for her pies. Making memories, and learning so much! Great job everyone!! Neighbor girl is growing So fast!! Wow! What a wonderful helper she is! Yes. It DEFINITELY looks like you all are having a good time!! It’s so nice of you to make take home goodies with your day care children, it extends the memory making from your home to theirs. I bet the families appreciated a homemade pie for dinner!!!! Looks like you have lots of fun with the kids but also much work! Oh Jo, I enjoyed checking out the background in each picture to see how your “new” house is working for childcare. It looks so great! Speaking of songs and rhymes, do you use nursery rhymes? I’ve found that very few families use nursery rhymes – they simply don’t know them. They are such a great source of story poems and examples. It’s sad that as a country we are losing them. I’m looking for some small bowls like the one Carver is holding. Think I’ll go to Toys R Us and see what they have…. You are so good with the kids and I know their parents truly appreciate all the love you give them. Little neighbor girl is learning a lot at your house. You make me wish I was one of your kiddos!